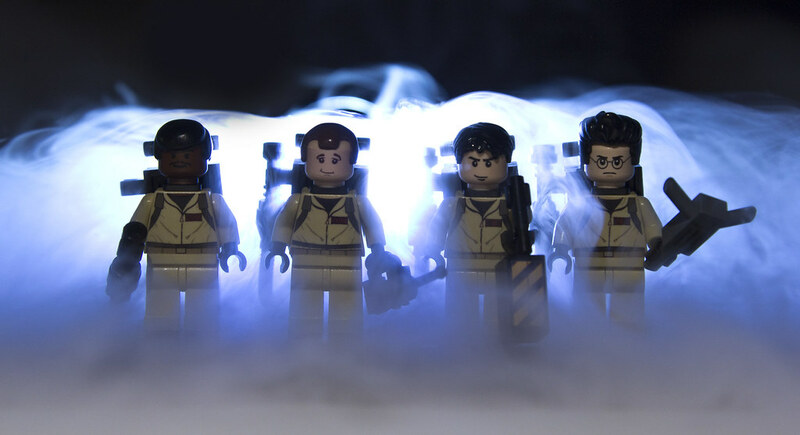 Lego to produce "Ghostbusters 30th Anniversary set"
Following a lengthy review process of Brent Waller's Ghostbusters: 30th Anniversary Set which reached 10,000 supporters last year, Lego's Cuusoo division has announced that their next release will be based on Brent's submission, featuring the four Ghostbusters and Ecto-1. The set is due out later this year, with final pricing still to be determined. Below are photographs of Brent's original model submissions, it should be noted that like the Back to the Future Delorean set, the final product will differ due to cost effectiveness and Lego's own construction techniques. I'll have to buy two of these. One for me, one for my sons. Now I kinda wish I'd gotten that Delorean. We're the best. We're the beautiful. We're the only. Ghostbusters! 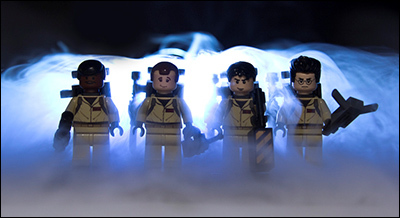 Now, we need one of those Lego themed videogames based on Ghostbusters. Get the cast to do the voices like in the Video Game or better yet get as many of the remaining "Real Ghostbusters" voice actors to do the voices! Gary Price is a GOOF!!!! I'm a little disappointed that the other set didn't receive consideration. I feel like the other guy should have gotten some credit as his project was started sooner, and literally reached the 10,000 less than 24 hours after this project did. When Brent initially unveiled his project, I asked.. why not work with the other guy? I understand now that the project creator receives 1% of net sales. (Which probably will amount to at least a few thousand, to possibly tens of thousands of dollars). Maybe I just don't understand how this works, but I'm baffled over how/why they announced both projects as possible finalists -- one with just the figures and car, one with the entire building -- then announce the building set as the winner...without the building. Especially since past Cusoo sets have shown us Lego will only use the winning designs as loose inspiration if they want to change the models. -The 30th Anniversary set got more supporters, not many more, but it's tally was higher. 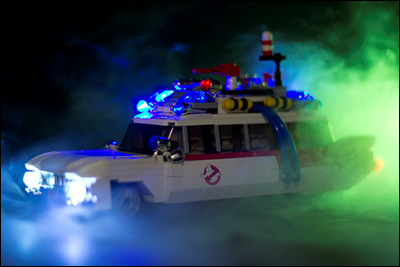 -The 30th Anniversary set was much more fleshed out, in addition to the Ecto-1 (and I do feel Brent's effort is better than Tee's) Brent also assembled real-world versions of the Ghostbusters and the Firehouse, rather than use what looks like a set of CGI models. I doubt they'll do it, but it would be cool if they made it able to convert to Ecto-1A, like the DeLorean can be changed to any of the versions from the BTTF trilogy. It wouldn't be hard to mod our own even if they don't give us the option. Ironically. The non-30th Anniversary one has more supporters now. Neither are over the 10k number... but new people aren't allowed to support it past the 10k. I'm sure that's because some accounts were removed, or perhaps some accounts werent' real. No firehouse? That's lame! Don't get me wrong, I'm glad to see the Ecto-1, but we've seen very few renditions of the firehouse, aside from an expensive 6" nightlight that should have been about 6" taller for the price. Looks like Ghostbusters beat both the Wizard of Oz AND Women Legos. lol This GB set should include an obligatory Kylie Griffin for good measure. I admit, I'm kind of surprised by this--I figured with the Minimates continuing (per the announcement at SDCC) they and Legos would be considered too similar and would be competing under the same license. Hope we get the firehouse too, sweet looking set. Definitely will pick it up. I'll be getting at least 2. The only reason I can see them being separate is because you have to put Legos together. This is fantastic, I am defiantly going to get these the first chance I get. Also I too think that a Lego Ghostbusters Video Game would be very fun to play if they did make one. I can live without the Firehouse, especially if it would've doubled the overall cost of the set to around $60 (if they had included it, it would've been incredibly simplified). "Look! 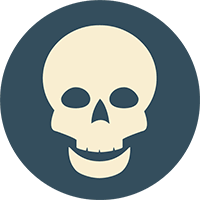 I hit someone!" -said no Stormtrooper ever. Chalk that estimate of mine up to getting my dollar/pound conversion muddled up, the set's about £35 here in the UK. So cool! I hope it'll be available in europe too, i'm kinda bored to sell my internal organs to pay shipping fees....!!! By the way... Why does Hermione Granger work for LEGO???? Holy smokes, I went to that link and saw that the star wars death star is $400!!!!! I couldn't imagine buying the firehouse if it was that price. Forget about actually putting it together, my word. I was thrilled that they went with Brent's design. He is a local here were i live. I took some pics when he had it on display at the Brisbricks Lego show. At least i will now be able to get him to sign a couple for me, when they go on sale.